Wednesday's strong sell-off created some potential technical problems for the bulls, particularly in the Dow Jones Industrials (INDU), where the decline overlapped the wave (1)/A high. I literally ran out of time while charting last night, and I'll simply have to publish what I have now and fill in the blanks in the next update. It's not helping that I came down with the Martian Death Flu yesterday, and feel severely under the weather. The first chart we'll look at is INDU, since this is where a potential key price overlap has occurred. Note the decline has now overlapped the blue wave A high. I suspect a snap-back rally is close at hand (toward black (2)) -- though this is purely anticipatory, based on the five-wave decline... the bulls need to break above the head and shoulders neckline and the red falling trendline first; until they do, the charts maintain a strong short-term bearish bias. This chart has a lot of annotations on it, and only outlines the bear count -- I'll outline the remaining intermediate bull potentials for INDU in more detail tomorrow; for now, I've discussed them only on the final chart of the Nasdaq 100. 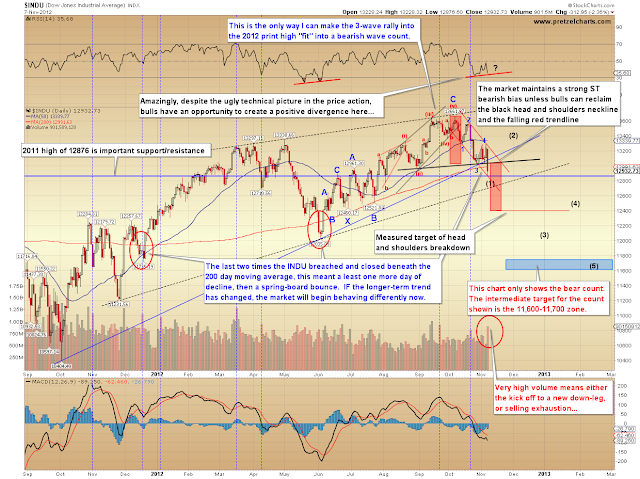 The next chart is the S&P 500 (SPX) bear count, which can't be locked-in yet, but which seems to be gaining traction. SPX did not overlap its key wave (1)/(w) high yet, so it is still conceivable that this is a fourth wave correction. 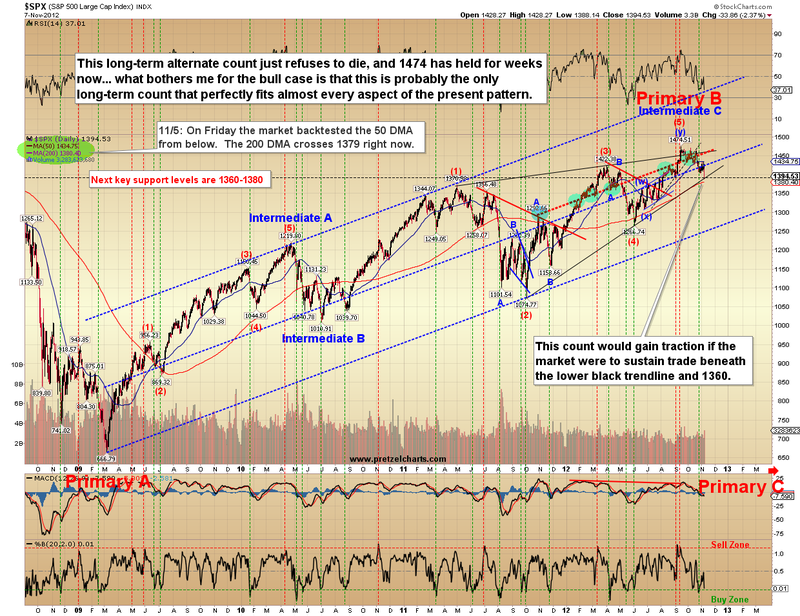 Again, this chart only outlines the bear potentials. 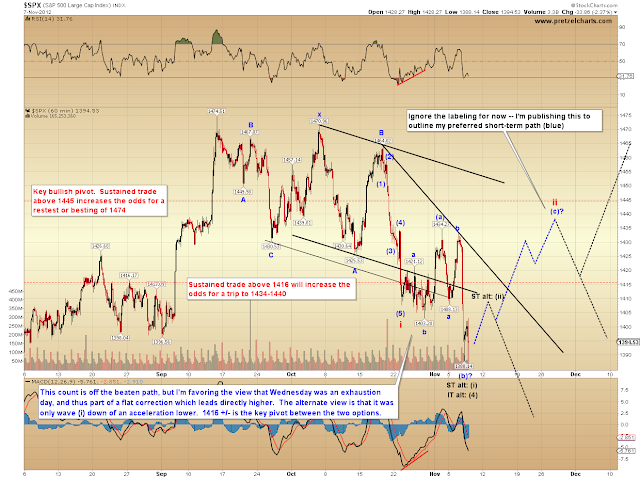 The hourly SPX chart has a bit more detail, and notes my preferred short-term path. This market meets the definition of "trying to catch a falling knife" and it should be strongly noted that trying to anticipate a bottom after a decline like yesterday's is quite difficult and often ill-advised. Nevertheless, I wanted to share my thoughts and observations on what appears to me to be a reasonable short-term path. Don't bank on this, though, as the decline could simply continue unabated. 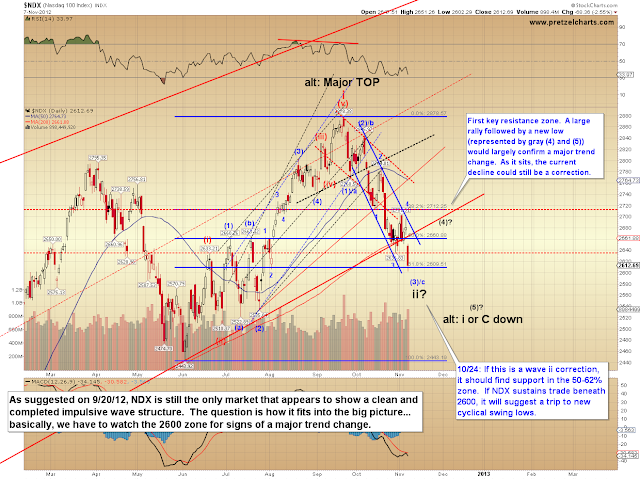 Finally, the Nasdaq 100 (NDX) chart does have a bit more detail on the bullish intermediate potential still in this chart. 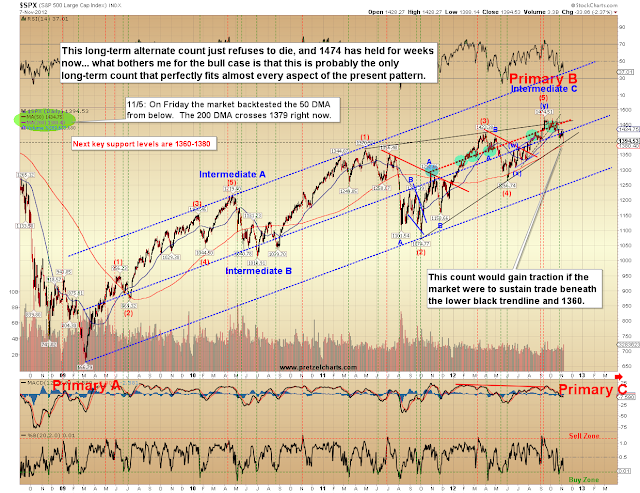 The rally from the June lows appears to be a five-wave impulsive form (meaning it is in the direction of the larger trend, though it could be the final wave of that trend). So far, the decline is still a three-wave form. This leaves open the option that this is a second wave decline (and INDU/SPX still share this option), which would be allowed to create the price overlap witnessed in INDU. NDX could provide some key tells going forward if the decline turns into a five-wave structure (noted by the gray (4) and (5)) -- and if that happens, it will suggest the trend has indeed changed for the long-term. In conclusion, the bears have done some important technical damage in INDU, and the potential we've been discussing over the past couple months for a more bearish outlook now has to be seriously considered. The bulls could always pull out a last minute stick-save, especially with the QE-Infinity liquidity due to start hitting the market on November 14, but as long as the market hangs around these price levels, it's in a dangerous position for bulls. Trade safe.